We hope we are welcoming, caring, stimulating, enjoyable and many other things! But St Mary’s is also a Church of England Voluntary Aided School. We are a partnership between the Local Authority, the Church of England and the local community, working together to provide an excellent education for children. 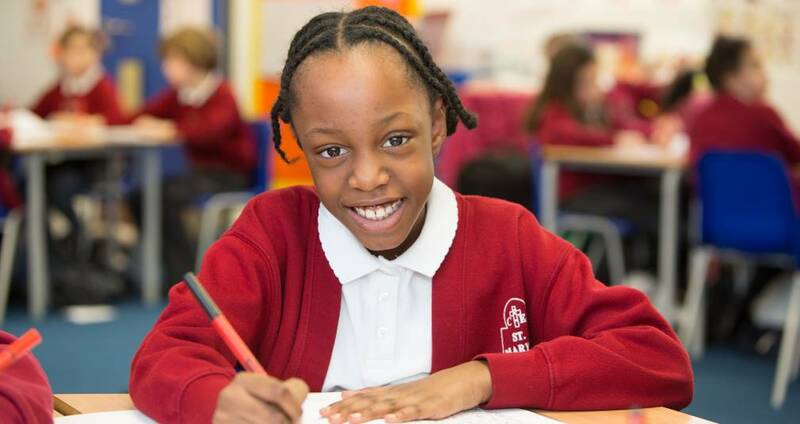 Through our explicitly Christian ethos we aim to foster the growth and well being of the whole child: physical, emotional, intellectual and spiritual. We understand that such growth is best nurtured by a partnership between school, child and home. As the United Nations Declaration of the Rights of a Child puts it, ‘Children learn what they live.’ An education at St Mary’s will best suit children and families who wish to embrace both the growth of the whole child and our living Christian tradition and ethos. Every year ninety new children enter the Reception classes at St Mary’s while a number of others enter other year groups as vacancies arise. St Mary’s welcomes all children from across our local community. Like all schools, St Mary’s has to prioritise admissions when more children apply than we have places available. When that occurs we use a list of criteria which are outlined in our prospectus. Once a child has been admitted we invite parents and families to be actively involved in school life supporting their own child and, through that, strengthening and enriching our local community. Most schools have to prioritise places offered to children. There are normally more children wishing to attend St Mary’s than we have places available. For details of the criteria we use to allocate places, please see the admissions section of our school prospectus.